Amber without any physical or chemical alterations. This does not include polishing, cutting or grinding. 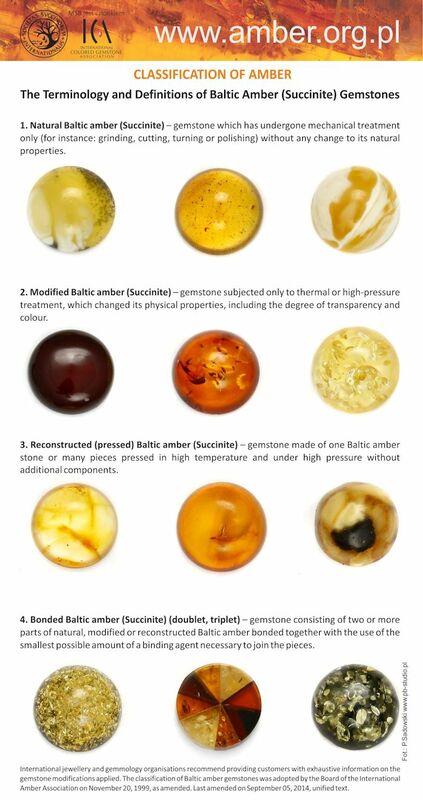 Mechanical treatment as mentioned does not change the classification of this amber - nor it's natural properties, so it is still considered 'natural amber'. Heat and or pressure treatment of one nugget. This can affect the transparency of the amber and sometimes the color. As far as that goes, it can also affect the shape. It is simi liar to the reconstructed amber (next) but the difference is modified amber is defined as a single piece. It is not caused to be fused with others, as reconstructed amber can be. Bottom line: gemstone subjected only to thermal or high-pressure treatment, which changed its physical properties, including the degree of transparency and colour. We have seen this done with individual pieces that have fossils (insects and such) in them. If properly done, this allows better observation of the interior of the specimens. It has been known for a long time that Baltic amber softens and becomes malleable at temperatures of 140 to 200 degrees Celsius, in an air tight environment. The pressure for this is usually between 200- 300 kg per cm2. This is use full when smaller bits need to be pressed together to form larger or irregular shapes. This can also clear otherwise mottled pieces of amber. Often done for jewelry, this method of change is moderately common. Seen in some of the Baltic amber are 'sun-spangles' which can add a beauty to piece. This is done artificially through heat and pressure in oil. It is seldom seen naturally observed, but if so, the spangles will not be uniformly scattered as in the artificial approach. Bottom line: gemstone made of one Baltic amber stone or many pieces pressed in high temperature and under high pressure without additional components. A gemstone consisting of two or more parts of natural, modified or reconstructed Baltic amber bonded together with the use of the smallest possible amount of a binding agent necessary to join the pieces. There is nothing considered wrong with the above changes to ambers as long as it is disclosed to the buyer. amber from Borneo - from Sarawak, the Malaysian part of the island. Finally, for some individuals, amber is only Succinite and only from the Baltic regions. All other resins (see above) are not real amber, but resins from other areas. If you speak of amber, then it is the resin from the Baltic area only. Not everyone agrees with this interpretation, so this approach has caused many arguments in many different groups. The classification of Baltic amber gemstones was adopted by the Board of the International Amber Association on November 20, 1999, as amended. Last amended on September 05, 2014, unified text.